So I’m not sure if I’ve mentioned this before or not. I have spina bifida occulta (SBO) along with everything else. If I haven’t mentioned it before, it’s probably because I have no idea what that means for me. As is often my luck, when I get different medical tests, the unexpected shows up. 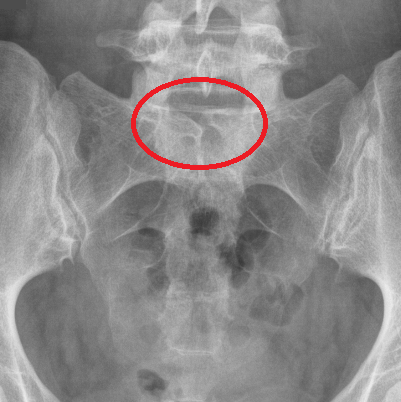 So on a series of neck and lumbar xrays, I learned that I have spina bifida occulta of my S1 (I also have bilateral extra ribs on my C7…I told mother she birthed a freak…). I was told it’s just an inconsequential finding, but others have shared different experiences. I haven’t had an MRI of it and that annoys me a little. I like to know everything that is going on with my body. Simply being told that I have SBO isn’t enough. I want to make sure it’s not hiding anything from me, like a tethered cord. Also, having EDS as well, it’s very hard to tell what’s caused by the EDS, by the SBO, or is just a random ache/pain. If anyone out there reading this blog (all five of you at this point 😀 ) have any experience with SBO educate me please!